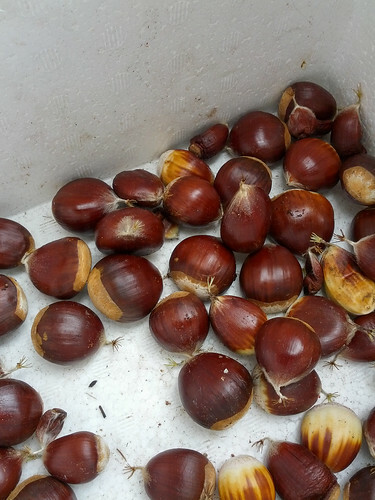 At the 23rd Street Garden, a block away from the Free Farm Stand, we've been harvesting chestnuts for the last several weeks. 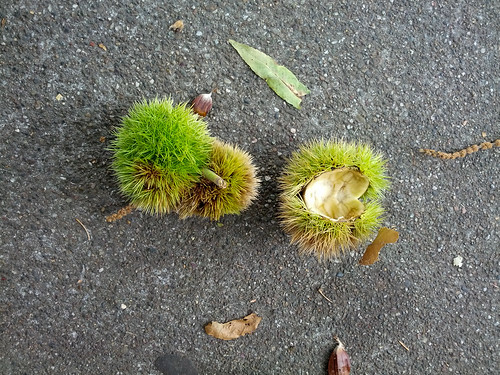 Until just this year I had no idea that chestnuts come inside green spiky pods. And I do mean spiky; the spines pierced right through my gardening gloves. Tree taught us to step on the pods and roll them gently until the chestnuts emerge. 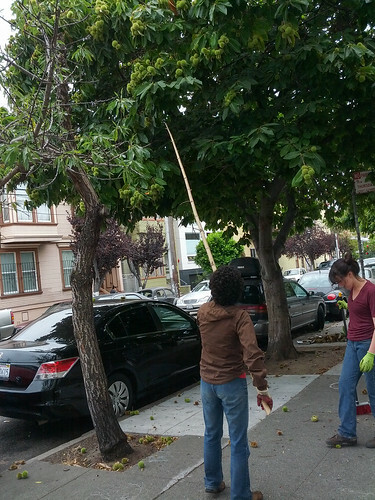 Here's one volunteer doing that while another volunteer knocks down chestnuts from the tree. Tree planted these trees on the sidewalk outside the garden in 1982. They were only three feet tall then! Not all pods contain a good-sized chestnut, but we did manage to harvest a fair number of them. Tree told me that a couple of people walking by while he was harvesting said that it looked like a terrible mess and that he should just cut the trees down. He had to explain that this was actual food! We give the chestnuts away at the farm stand on Sundays. I was also happy to explain this to curious neighbors and garden visitors. It's wonderful to be able to connect to the food we eat in such a direct way. Connecting with neighbors and helping with food security is what this project is all about. One man who walked by stopped to talk about how he moved here from El Salvador decades ago, barely spoke any English, commuted and worked and went to school for 18 hours a day so that he could make his way in the world. He now has his own business just around the corner, and does some free work to help poor clients. I gave him an avocado from the garden and he offered to donate a hammock to us. Since we didn't have a lot of chestnuts I didn't take any for myself, but I wanted to make something with chestnuts. So I took some old ones I had bought over a year ago, hoping they were still good (they were packaged and hadn't passed the expiration date). I found a recipe in the Forks Over Knives cookbook for a soup that used chestnut puree. I found a recipe for chestnut puree online. (I used almond milk instead of dairy milk.) Unfortunately after I boiled the chestnuts I couldn't get all of the peels off, and the puree and soup ended up tasting bitter. It also looked unappetizing, so I didn't take a photo. Oh well, I'll try again sometime. Roasting chestnuts will be lovely once the weather turns cooler. Roasted. Chestnuts are a delicious snack!